The archive is a collection of records chronicling the pioneering radio research work that was carried out at Ditton Park in Slough from 1924 to 1979. In 1920 the Department of Scientific and Industrial Research formed the Radio Research Board (which located at Ditton Park in 1924) to undertake valuable research into radio science. This was the beginning of a high-quality scientific establishment that was led by a team of enthusiastic and expert scientists including Admiral of the Fleet Sir Henry Jackson, Sir Edward Appleton, Sir Robert Watson-Watt, Robert Naismith and Reginald Leslie Smith-Rose. The Radio Research Station (as it became known) was home to the invention of radar by Robert Watson-Watt and authoritative studies on ionospheric science. Over the years the Station amended its research programme to remain at the forefront of radio science while introducing new fields of study, this was reflected in the growth of space science research from the late 1950s. Following several name changes, the Station became the Appleton Laboratory in 1973 and remained so until the merger with the Rutherford Laboratory at Chilton in Oxfordshire in 1979. Today, the Rutherford Appleton Laboratory is a world-class scientific establishment and the work of the Appleton Laboratory has been continued in the Space Science and Technology Department. The archive is held in the World Data Centre for Solar-Terrestrial Physics within the department. Former staff at Ditton Park have a website and email list at http://groups.yahoo.com/group/DittonPark/. The records in the archive include 1930s Appleton ionogram graphs, ionospheric recording books and correspondence between the Station and its employees working at Tromso in Norway for the 1932 International Polar Year. 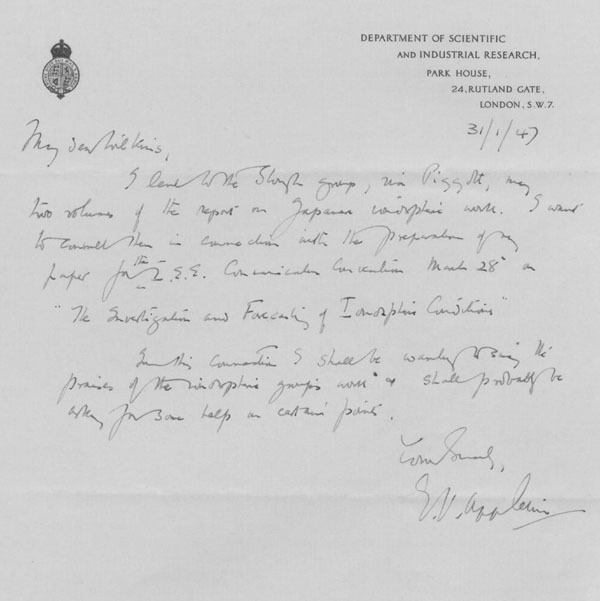 The early work of the Station is recorded in the minutes of meetings and scientific reports while small collections of correspondence by members of the scientific staff are informative about specific projects and collaborations with other institutes within the United Kingdom and internationally. There is a sizeable collection of photographs that provide a fascinating history of the facilities and equipment used and developed at the Station. Search the archive by clicking on Archive Collections or by using the page menu. Letter to Mr Wilkins from E.V.Appleton. January 31st 1947.